This trusted teacher guide and widely adopted text provides a comprehensive conceptual framework and hands-on practical tools for reading assessment. The authors present a clear roadmap for evaluating K-8 students' strengths and weaknesses in each of the basic competencies that good readers need to master. Teachers learn how to select, administer, and interpret a wide range of formal and informal assessments, and how to use the results to improve instruction. 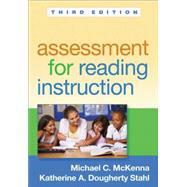 In a large-size format for easy photocopying, the book includes 30 reproducible assessment tools. Purchasers get access to a Web page where they can download and print the reproducible materials. *Additional instruments, including the Informal Decoding Inventory and the Motivation to Read Profile--Revised. *Links to the Common Core State Standards (CCSS) have been added throughout. *The latest research and more instructional strategies in every area. See also Reading Assessment in an RTI Framework, which offers systematic guidance for conducting assessments in all three tiers of RTI. Michael C. McKenna, PhD, is Thomas G. Jewell Professor of Reading at the University of Virginia. He has authored, coauthored, or edited 23 books and more than 100 articles, chapters, and technical reports on a range of literacy topics. His research has been sponsored by the National Reading Research Center and the Center for the Improvement of Early Reading Achievement. Dr. McKenna is a corecipient of the Literacy Research Association’s Edward Fry Book Award and the American Library Association’s Award for Outstanding Academic Books. His research interests include reading assessment, comprehension in content settings, reading attitudes, technology applications, and beginning reading. Katherine A. Dougherty Stahl, EdD, is Clinical Associate Professor of Reading at New York University, where she serves as Director of the Literacy Program and teaches graduate courses. In addition to teaching in public elementary school classrooms for over 25 years, Dr. Stahl has extensive experience working with struggling readers in clinical settings. Her research focuses on reading acquisition, struggling readers, and comprehension. Her books include Reading Assessment in an RTI Framework (coauthored with Michael C. McKenna). She is a recipient of the Jeanne Chall Visiting Researcher Award from Harvard University and the Teaching Excellence Award from the Steinhardt School of Culture, Education, and Human Development at New York University.